Some 3 miles east of Banchory and 14 miles south-west of Aberdeen, this is a real fairytale castle - a definite must if you are in the area! With its portraits, oak ceilings, heraldic shields, Elizabethan fireplace and more, Crathes is uniquely preserved. The castle is particularly famous for its Jacobean painted ceilings, only uncovered in 1877. These can be seen in the Chamber of the Muses, the Chamber of Nine Worthies and the Green Lady's Room - which is said to be haunted. One of the most historic objects is the Horn of Leys, a jewelled ivory horn on display in the hall. It is thought to have been given by Robert the Bruce to the Burnetts in 1323 when he granted them the Lands of Leys. Only later, in 1553, did they begin to build the castle. It wasn't completed until at least 1596 and the east-wing was added in the 18th century. 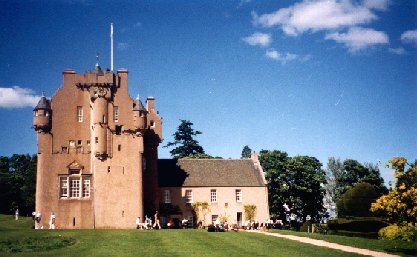 The castle stayed in the hands of the same family until 1951 when Sir James Burnett presented Crathes to the National Trust for Scotland. The current visitor centre stands in place of the Queen Anne wing which was destroyed by fire in 1966. The colourful formal gardens are particularly beautiful and much praised. They are divided into 8 themed areas by Irish yew hedges which date from 1702. The avenues of lime trees may be even older. Certainly worth a visit. The castle is run by the National Trust for Scotland and is open all year (except Christmas & New Year) - click here for opening dates/times and prices. The new Go Ape tree top adventure course with high wires and zip wire is open at Crathes to those over 10 years. Admission charge applies. 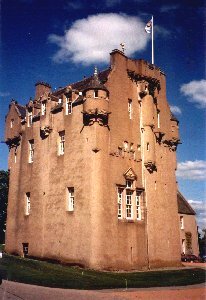 A visit to Crathes Castle can be included on your customised itinerary with ClansandCastles.com who offer personal guided trips from Aberdeen and Inverness. 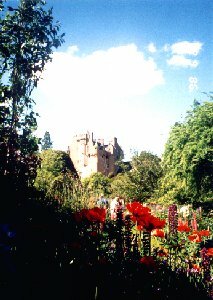 You can also visit places on the Aberdeenshire Castle Trail on the same day. Celia Ffitch-Stewart is a fully insured driver-guide with Mercedes limousine for private tailor-made guided tours. Half day, full day or extended tours. Themes to suit your interests can be arranged including The Castle Trail. Meet your clan chief, trace your roots, stay in a castle. Airport collection (Edinburgh, Glasgow, Aberdeen or Inverness). Services can include itinerary planning and accommodation reservations. Also available for weddings. Member of HOSTGA (Highlands of Scotland Tour Guide Association).